Its no accident that there's always something flapping or buzzing around my garden. Of course it helps to abstain from killing pests, and butterfly host plants are also great, but without shelter my animal friends wouldn't be enticed to take up residence. Anyone familiar with ecology will tell you that the greater amount of surface space an area has, the greater biodiversity you'll have! Take for example coral reefs and tropical rainforests, with their myriad layers of life. Also, I end up with a lot less "bad" bugs with all the pieces of the food chain in place. You want to garden green? By creating refuges for beneficial wildlife you can forget about using environmentally friendly pest control and skip buying pesticides altogether! It Protects Plants From Frost! 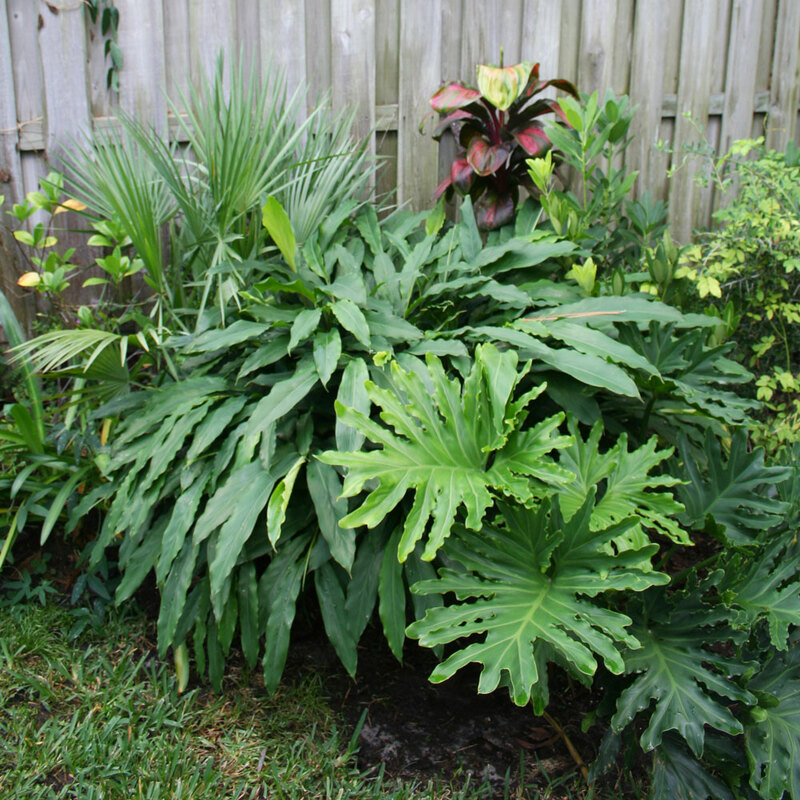 This is my favorite benefit, since I'm all about growing tropical plants where its supposed to be too cold. The added layers of plants act as a natural blanket during frosts, protecting the more tender plant beneath. I know a lot of you guys here in Florida have noticed this effect too! 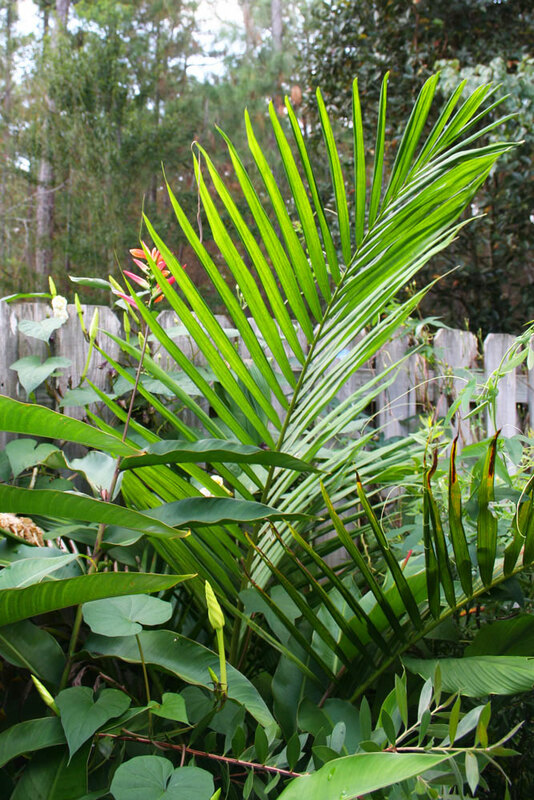 A neighbor down the street has a tropical majesty palm planted amongst shrubs and perennials that protect the palm's crown, even in these last two unbearable winters. The slightly hardier Picabeen palm above has been planted between two evergreen bottlebrushes, which will form a canopy over the growing point. I'll also plant some sweet peas at the base of the palm to protect it further! When you think of rainforests, you envision a lush paradise of exuberant and wild bounty, draped in greenery. Every surface is coated and dripping with life, and no surface is left unadorned with some sort of opportunistic plant that managed to use its talents to its advantage. The tropical look is great for other garden styles (especially modern), but I hope for the Rainforest Garden to someday embody both the "Tropical" and "Natural" styles, using bold foliage and exotic flowers to recreate a wild looking jungle. I'm going for a theme park garden here! It Keeps the Weeds Out! I never find weeds where my plants have densely filled in, so mulch isn't even necessary! 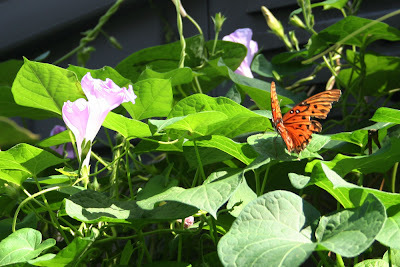 I prefer to use a "living mulch" like sweet potato vine or passionflower in the emptier spots of the garden to serve as temporary fillers. By covering the soil like this, I'm not only blocking out weeds but cooling the soil in summer, shading it from the sun, and creating a verdant tapestry that's uninterrupted by brown and blah mulch. When I don't have to use mulch, I'm not contributing to the avoidable felling of cypress trees in Louisiana. When it comes to hurricane, Katrina people can point fingers and lay blame for the disaster all they want. The loss of cypress habitat as a buffer was certainly a contributor to the devastation since those forests would have helped to diffuse the storm surge, flooding, and winds. And even if you don't subscribe to the notion of global warming, even you can measure the difference in temperature between a densely planted area of your garden and an open expanse of mulch. Ever heard of the Urban Heat Island Effect? If you look at zone maps of Florida, you'll see how the temperature zones now swoop up and into Orlando and Jacksonville, all because of a lack of green cover. That's right, you can fight global warming in your own neighborhood without spending loads of cash on trendy products! 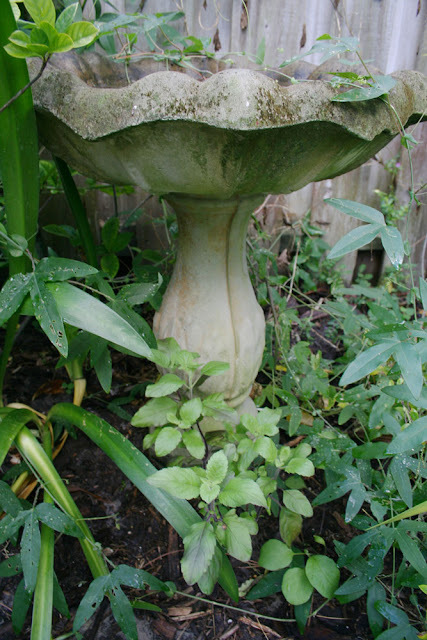 Here I've planted holy basil at the foot of the birdbath, and elsewhere I've planted peppers, Mexican tarragon and other edibles. Square and blocky rows of veggies are neat, but they aren't a possibility in my garden. I'm toying around with using edibles as part of the ornamental landscape, popping them into the sunnier spots where weeds would otherwise pop up! They're cheap, yummy, and also make a fine textured foil for the big and bold tropical leaves. Why not? I like your points, all good ones especially the part about keeping the weeds out and it looks more tropical. I love it because it makes things look more established. 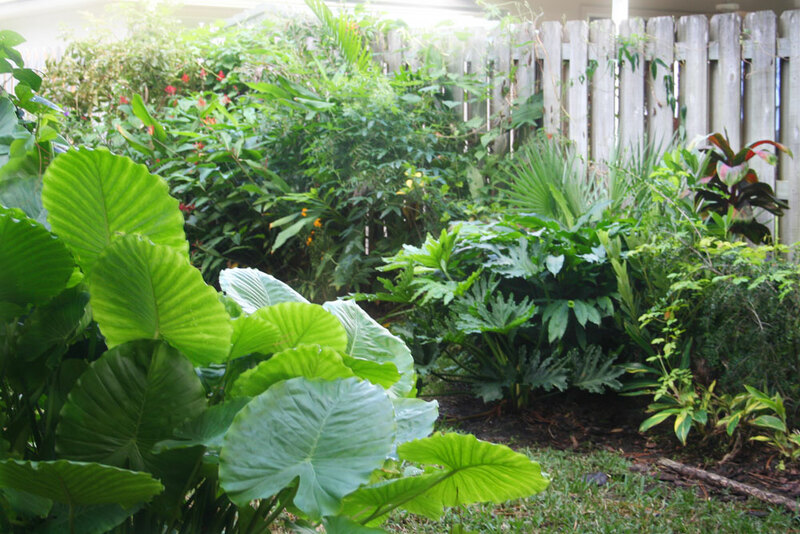 Your garden is looking lovely and lush! You obviously are doing lots of things right! Another reason is that some plants will go dormant in the winter and you need the other plants around them to fill in those bare spots. That's another good reason! To think that much of the garden was completely empty over a year ago! And you have another good reason too! The spots that I'm filling in are the areas where the deciduous gingers are dying back. I wish I could find something to plant in the very dry rear of the yard, where it normally floods but is now bone dry! Even the agapanthus is dying back! Are you an okra eater??? I sure can attest to the beauty of the leaves and it is so fun to get them all summer long! This would be a good one for you where you live! I have one tucked in my flower tire gardens and it is gorgeous! Hi, Steve. I think we share the same gardening style. I'm always searching for another few square inches where I might stick in another plant. Anyway, I love your photos. BTW, the NWS says it should be a warmer winter, at least in S. Fla., so maybe you won't need to worry about the frost this season. I read in a garden magazine many, many years ago that any garden bed, any plant combo, will look great as long as no dirt is showing. I think it's probably true. Certainly true of all the tropical gardens I visit. Personally, I'm still working on filling in my garden beds and covering that dirt. I tried to space appropriately, by the book, the first year I planted, but some things are just so stinkin' slow to fill in their allotted space! And the past two winters haven't helped. For now, it's mulch, when I can spare the time and money to get it. I don't use cypress, though. It's newspapers, pine bark, or oak leaves here at PITV. I'm amazed at how lush and beautiful your garden is now winter is long gone. Couldn't help but notice that 'Willi's Gold' popping out of one of your beds! Love it! It's definitely one of my top fave plants. The swirly colors seem to change from month to month. I just took pics this morning of mine, so they'll be hitting my blog this weekend. Well said, Steve! 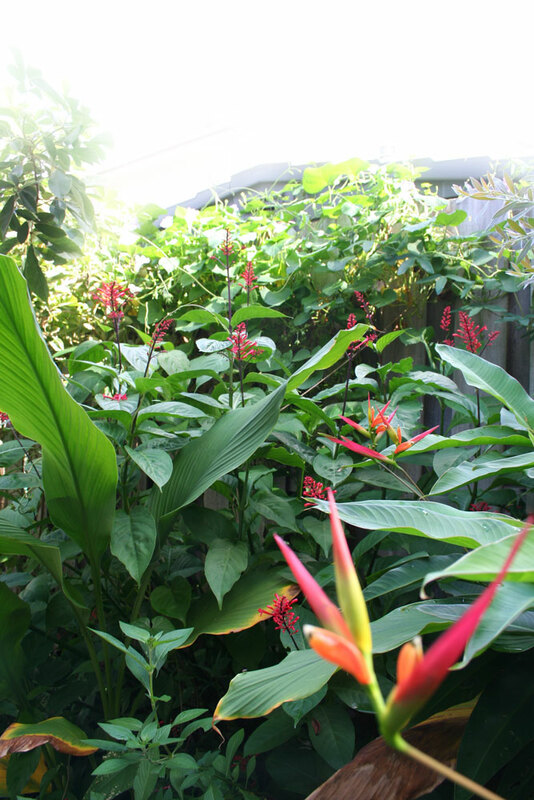 Your garden definitely has that lush tropical rainforest feeling. I'm still surprised you can do this as far north as Jax. Beautiful! 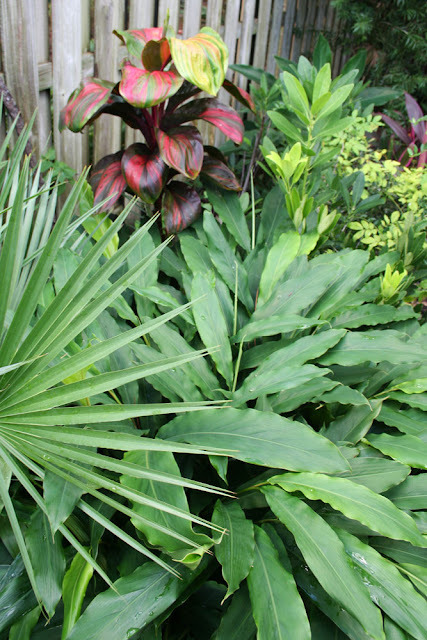 I totally agree with you on dense planting for tropical plants. That's also the effect that I would like to achieve for our garden in the making. I need to look into growing Okra! Maybe this next season would be a good time... ooh, wouldn't it look good planted with hibiscus? I really hope this winter is warmer. The last winter was great since it tested what my plants could take, but it would be nice to have a year of recovery. Nature does abhor a vacuum! Especially in the rainforest where every tree is covered in growth. Oh, and I love barrel cacti! I'll get to the other comments later... thanks everyone! You know, some plants are still doing well back there. believe it or not my alocasias are all doing well, and I'm sure their waxy succulent leaves are to thank for that! My turks cap hibiscus, split leaf philodendron, rubber ficus and african iris' are still doing well too, even though they were inundated the last two summers. I'll have to check out your post! I agree that things look good with no dirt showing. And you know, the only place my variegated ginger has thrived is where I planted them close together! The other ones are practically still dormant. I like your recipe for mulch, and wish I could collect the oak leaves each year before the yard people get em. You're also absolutely right about the ti plants changing their colors every month, even the non variegated ones too! You'll notice that the newest leaf on the Willi's Gold is a different color entirely! You've given me the biggest complement in so few words! 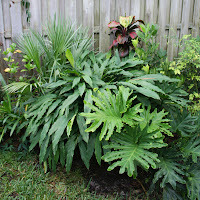 I wish that people outside of Florida realized how unusual my tropical garden is for this area! If you look at other yards around here there's rarely an attempt to create the same look, and there aren't too many gardeners around here to relate to. I'm actually lucky to not have such a big garden to fill! If it was any bigger, gardening would be pretty frustrating with my limited funds! Your garden's already beautiful, by the way! Interesting post. Good information. Gardening really is different for each region. I'm sure Florida is much different than most other states because of it's unique climate. Thanks for sharing. I like the cloches! Florida really is different... humidity, warmer nights, wet summers and dry winters. It really does look nice, and all the botanical gardens do it too. Of course there are always exceptions to when it works, but its worth a try for the most part.